In addition to purchasing credit on Bidvine.com, you can also do so via the Bidvine for Professionals Android App. 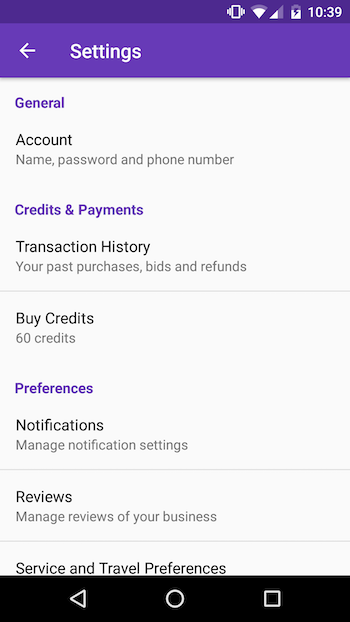 To purchase credits via the app, select "Settings" then "Buy Credits". Select your desired bundle and click the "Purchase Credits" button. At this point, you can authorise the payment through Google Play. Please note that credits are more expensive when purchasing via the app. This is due to the markups charged by Google. To get the best prices on credits, purchase them directly on Bidvine.com. In addition, we recommend you enable auto top-up after your first purchase so that when you run out of credits, the system automatically re-purchases your bundle of choice.